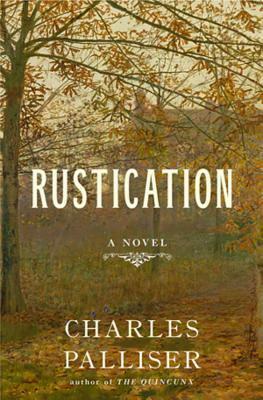 In British usage, rustication refers to a suspension from university; in the case of this historical mystery novel the rusticated is Richard, the opium-addicted, seventeen year old protagonist, fraught with the sexual urges of youth and the disappointment of his family. Richard’s banishment from school forces him to return to his recently widowed mother and hostile sister, in their newly acquired isolated home in the country. Mysteries and uncertainties abound for Richard upon his arrival, the mysterious behavior of his mother and sister, the state of the home, the uncertain circumstances of his father’s death. Keeping his own secrets of what transpired at his school to precipitate the rustication, Richard struggles to deal with separation from the poppy and the hostility of his family and their neighbors. Coupled with the strife of family and social relations, the community soon finds evidence of a deranged mind or minds – mutilated animals, and vulgar, cruel letters sent to women. Richard’s troubles and his prying into the oddities of his family and the community eventually throw him into suspicion. Written as a ‘found’ diary by Richard, one of the aspects of “Rustication” I did appreciate was his voice and character. He is a finely and subtly rendered seventeen year old of the era – or any era for that matter – in that he is extremely inconsistent. At moments he is vulgar, at moments he is a gallant gentleman, at times he is striving to do his best and help his family, at other moments he gives into the euphoria of the opium. And above all he is inconsistent in the objects of his desires, full of hormones, yearning and imagining sexual liaisons with near every eligible female who crosses his path, turning from infatuation to disappointment and disgust, and back to infatuation. Given the remainder of the characters are only seen through Richard’s eyes, they remain rather flat, and unreliably represented throughout. This is unavoidable with the construction of the novel, and I didn’t mind too much, given Richard himself was fascinating to me. The book is also written with a lovely period Gothic tone that I enjoyed. However, these weren’t enough to bring me anything more than a mild entertainment through reading it. The plot is slow to start, focusing on family conflicts and the social games between various Houses (families) until half way through when the crimes begin to occur. The letters are vulgar indeed, but after one, you get tired of reading their depravity, obviously intentional bad spelling, and you say enough, get on with it. The story ties together the family issues, Richard’s history causing the rustication, and the crimes into one overarching series of scandals, cover-ups, and machinations. It ends up feeling like too much, and yet too little. The perpetrators of the crime don’t come particularly surprisingly and the lack of any other resolution leaves things feeling empty in what is already even a short novel.